December 2012 - The fifth proof has been sent for printing. I think it's done. I have ordered 5 copies of this one; there were 3 copies of p4 (one of which I sent to Charles Darwent); and one each of the first three proofs. 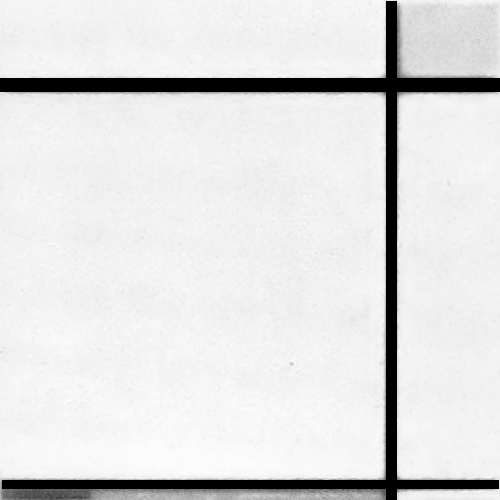 Eleven copies, in various states, in total. The intention is to publish in February 2014, sending copies to many potentially interested parties and then make it generally available on Lulu. 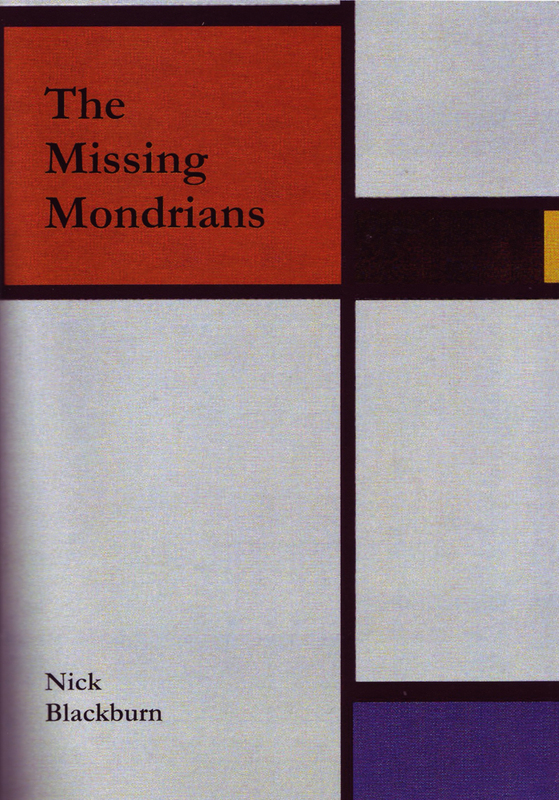 August 2011 - My book The Missing Mondrians is published at last. This is the only copy in existence. Fourth proof version printed July 2012 - it's nearly ready. 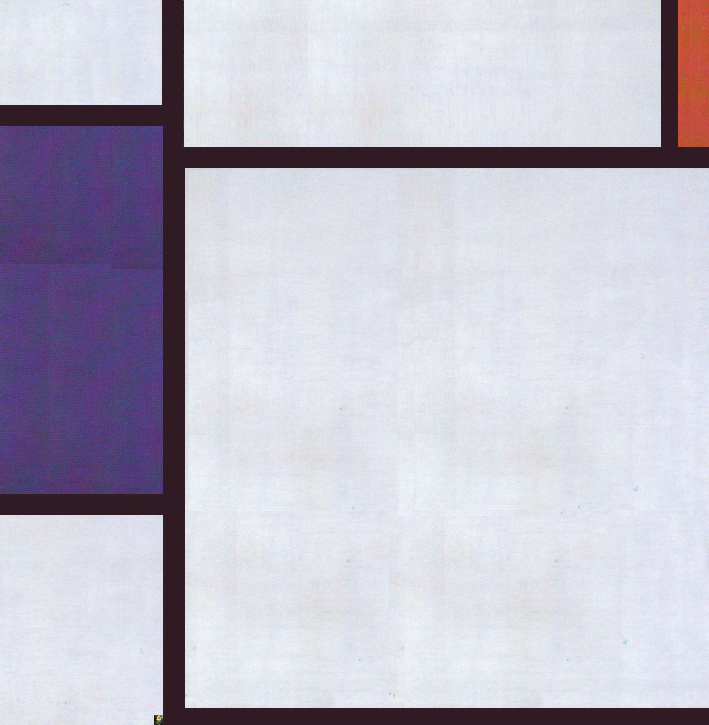 The idea behind this page is to reconstruct the lost Mondrians. 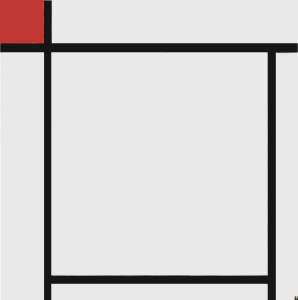 This inclination was brought on by reading of the fate of the 1921 B118 and B119 abstracts: Composition with Large Yellow Plane and Composition with Large Red Plane . The Catalogue Raisonné (CR) describes them as 'lost in fire during the acts of war'. 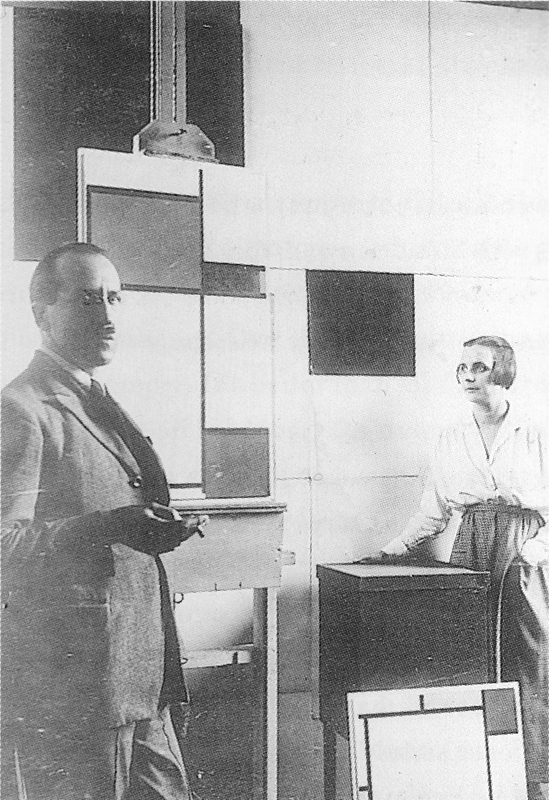 They were both owned by Wim and Tonia Stieltjes and from 1932 on loan to Marlow Moss. 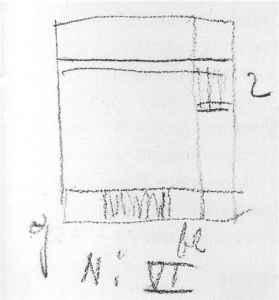 Two lost while in the possession of Marlow Moss - B118, B119 (note that all of Moss's own works were lost during the war, perhaps in the same event(s): I'll look into that). B93 - Exhibited at the Hollandsche Kunstenaarskring, Amsterdam, 1918, no mention of an installation photograph. The photograph in CR is from the V. Huszá estate, published in De Jongh De Stijl. 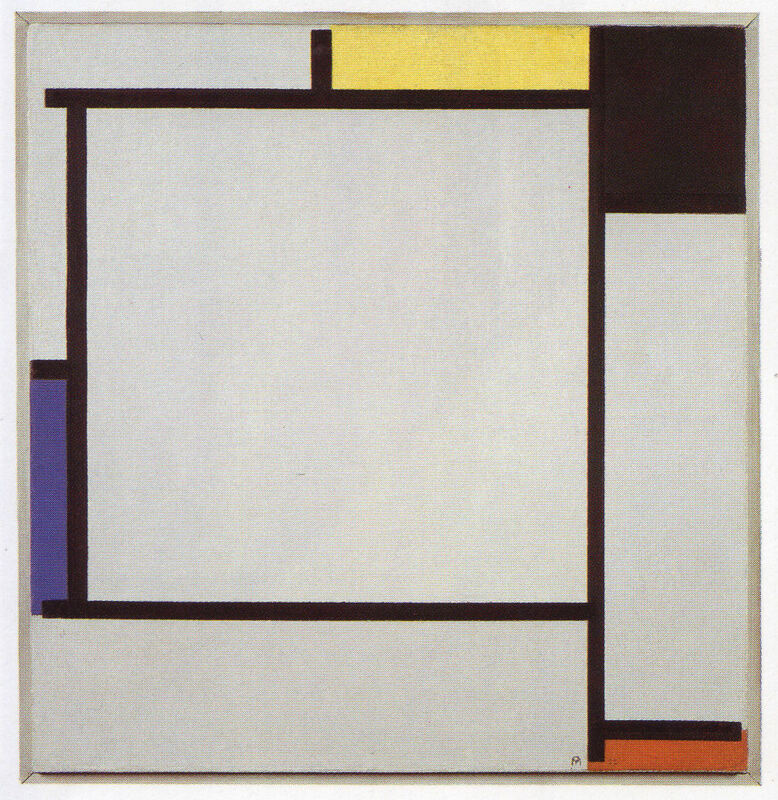 1972 and in Hoek Mondriaan, 1982. 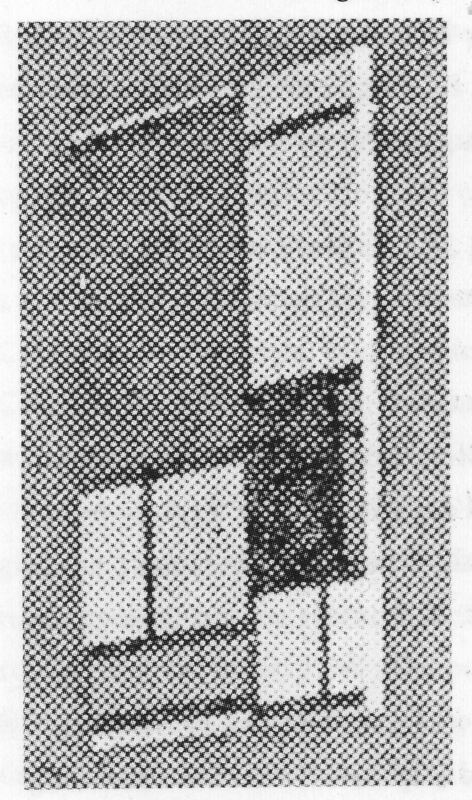 B171 - The photograph is cropped from an installation view from Dresden 1926 which also shows B154. 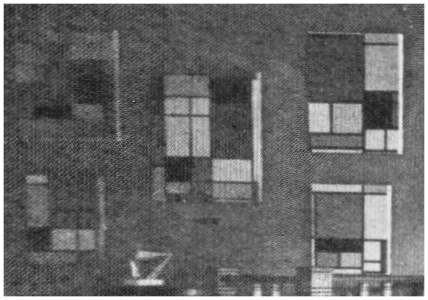 There is a very small image in CR (III p33) and a larger version is needed: it is attributed to Gosudarstvennaja Tetrakoskaja galerja, Moscow but I cannot find a decent link for that establishment. A few searches in Google images has turned one up, though, see B171 below. 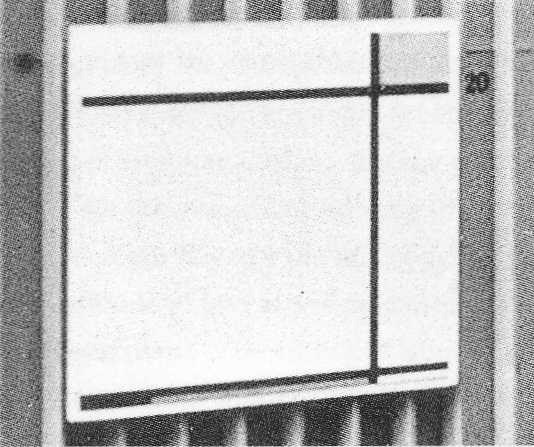 B174 - This is in the same installation shot as B149, for which a decent copy has already been found in Blotkamp. B175 - CR lists photographs of PM's studio at 26 rue du Départ in Dreier Modern Art, 1926 and Loon Mondriaan, 1927. Found one in Milner: on first glance there's not much to help with colours. B180 and B181 - The only known photographs are Harry Holtzman's. Not sure where to go with that one. B184 and B186 - appear in an installation photograph from Der Stuhl, Frankfurt, 1929: the one with all the chairs. Originally published in Das Neue Frankfurt, 1929, there is a small copy in CR and I'll seek one of decent size. There's a slightly larger one in Bois, (see B184 below) but I'll keep looking. 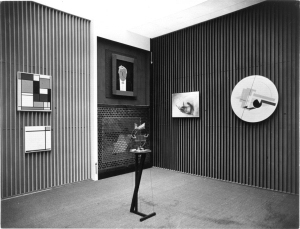 B202 - CR lists an installation photograph of Room G1 from Munich 1937 published in (I think) Lüttichau Deutsche Kunst und Entartete Kunst, 1987 (see above note) and also a reconstruction of Room G in Lüttichau Entartete Kunst, Munich 1937: A Reconstruction, 1991. I'll have a hunt. [January 2011] Another six done and seven eight more to go. B119 - it must be time to try this one. 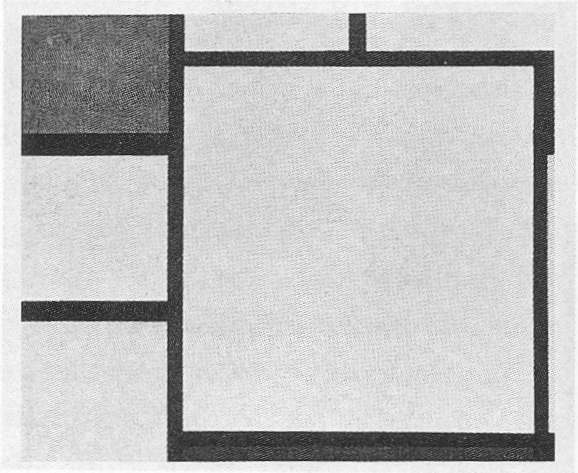 B175 - I have a colour image (probably someone else's reconstruction) of the stage set somewhere. I'll use that to decide the colour. B184 and B186 - the chair pictures. Still looking for a better installation shot. 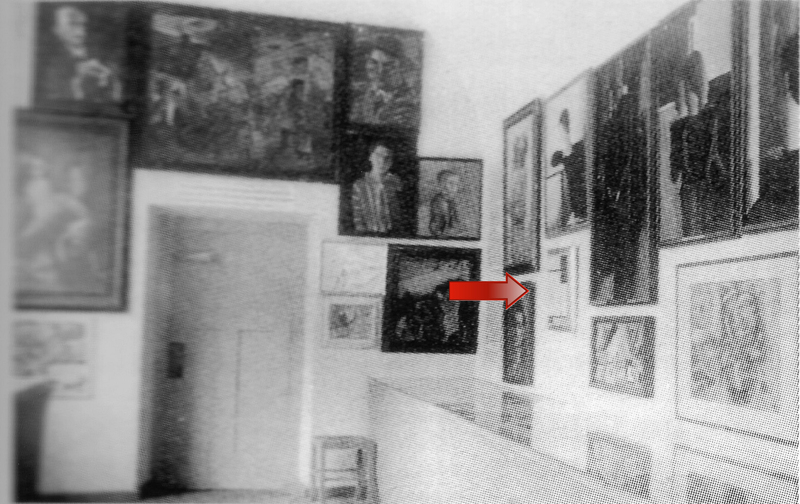 B202 - the other Entartete Kunst picture, needing further research. and a late addition, B148 which isn't in colour in De Stijl, either. 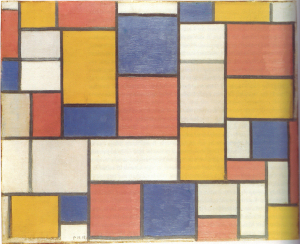 As noted in the page on materials and techniques, Mondrian regarded the lines as more important than the colours. 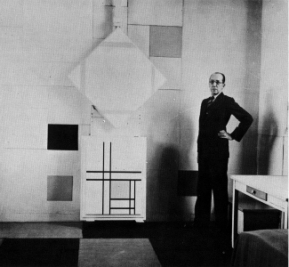 Blotkamp quotes a letter he wrote to Alfred Roth, a prospective purchaser, in September 1929, 'Let me know whether you prefer blue and yellow, white and grey, or perhaps red, a bit of blue and yellow and white and grey. 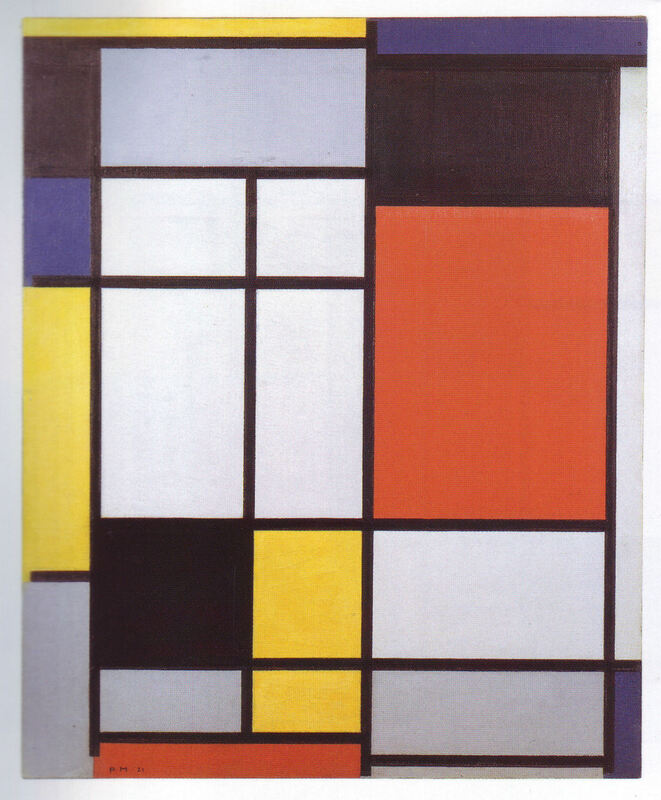 The latter works with red in them are more "real", the others more spiritual, more or less.' 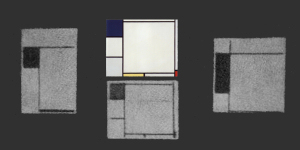 While it is important to get the colours in the reconstructions as close as possible to the originals, the structure is key. [February 2011] I have misled myself on B148 and B149. 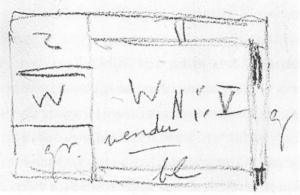 The CR entry states 'repr.col.97' which I had taken to mean 'colour', but, I guess, means 'column' or something equally unhelpful. 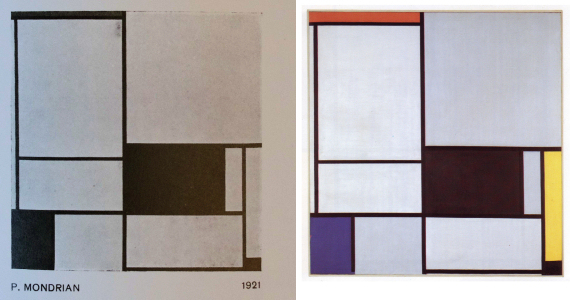 It did seem unlikely that a 1924 publication would have colour reproductions, but optimism overcame reason. Five Four left to go. [June 2011] I am trying to finish off the process and then self-publish a small booklet on the process. My efforts to obtain better photographs to work from for the last four paintings have been ignored completely. 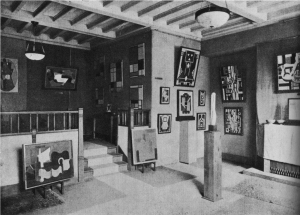 The pictures were exhibited in Paris in 1921 and in Amsterdam in 1922. 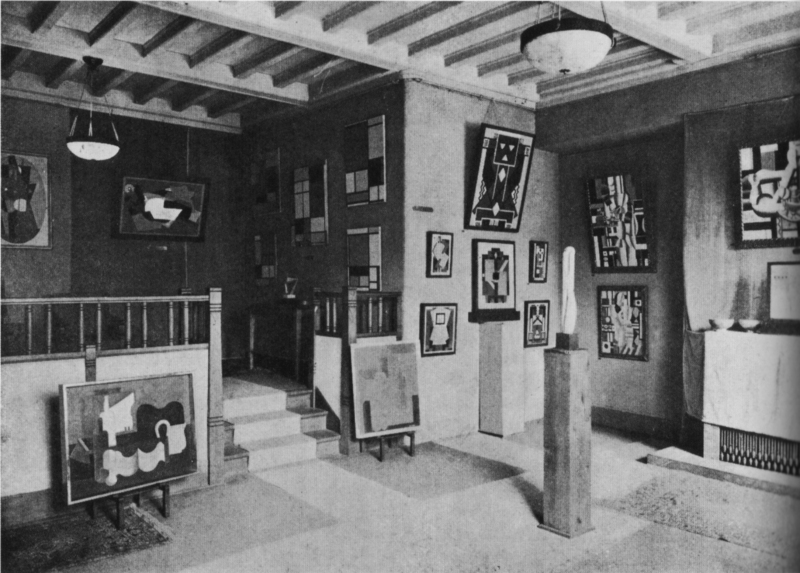 CR shows images from the Paris Œuvres nouvelles exhibition, published in the Bulletin de L'Effort Moderne, 1924. Here are the original images from CR. [Nov 2010] There seems to be some confusion in CR over which is which: in the main catalogue listing they are in the order here with B118 shown in full and the bottom of B119 obscured by a handrail. When describing the installation photograph shown below, this is reversed, with B109, B116 and B119 on the 'upper row'; B117 and B118 below, specifically B118 'lower right'. 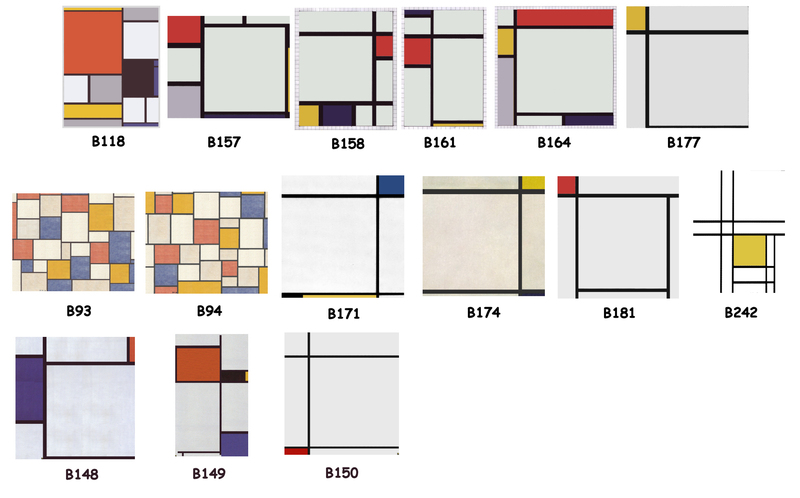 This is significant because I have based the reconstruction so far on the installation version, making the picture top right B119, i.e. the one with the 'Large Red Plane'. 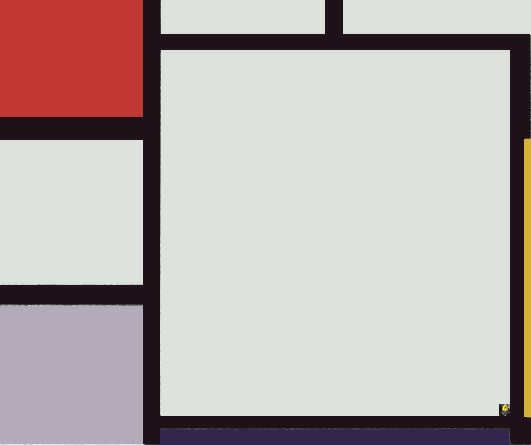 Having completed my first draft colour reconstruction of B119 on that basis, I'll stick with that for now. 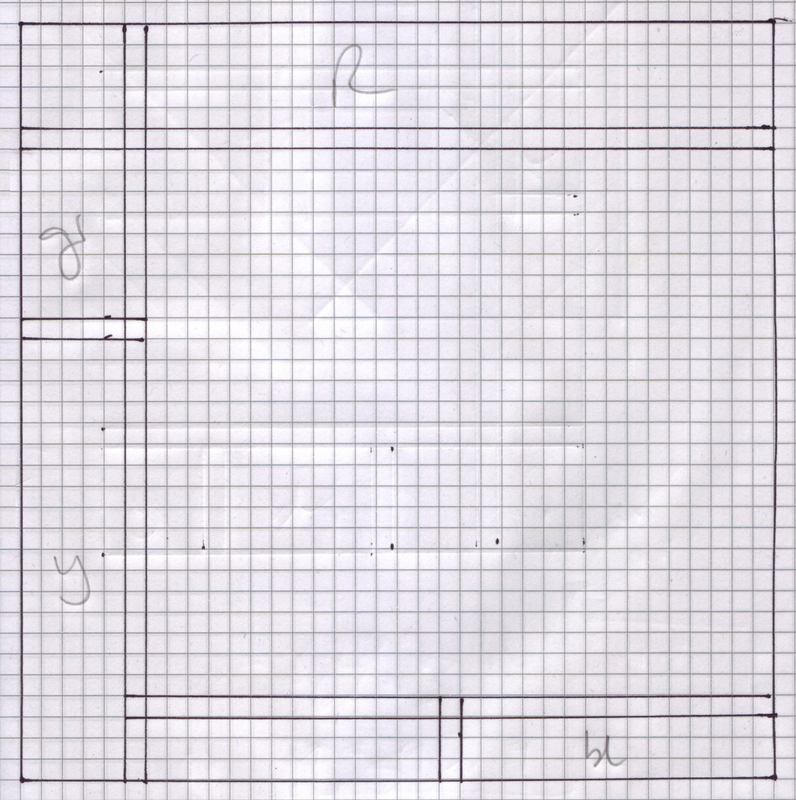 Paintshop Pro includes a tool to correct perspectives which gives these results. 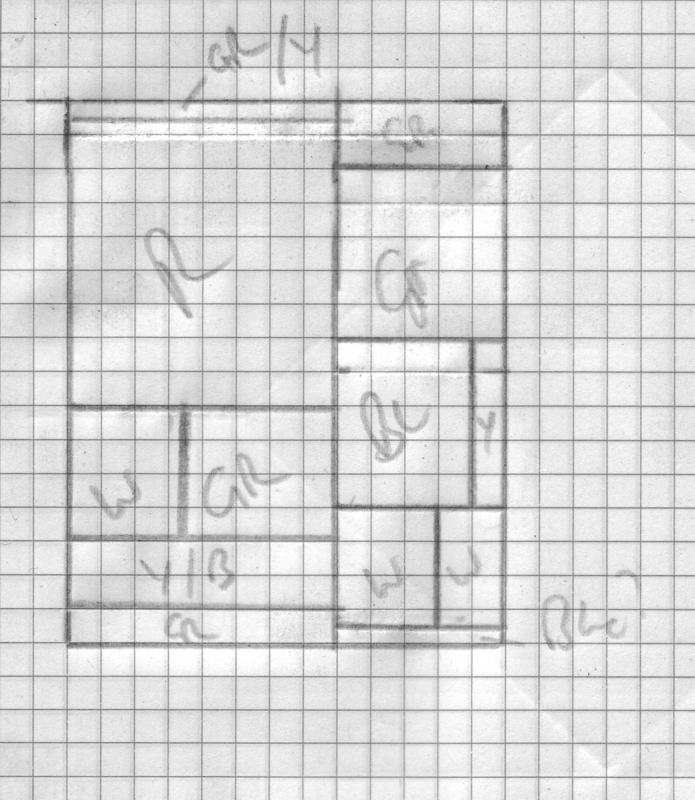 This gives a reasonable idea of the layout, though CR does not suggest size. I suppose that if I could obtain a copy of the 1924 Bulletin, depending on the images available, it might be possible to compare the Mondrians with other pictures on show for which sizes are known. There is a copy on sale for $125 at Fatbaba, but I'll have to try libraries. Back to colour identification in a while. 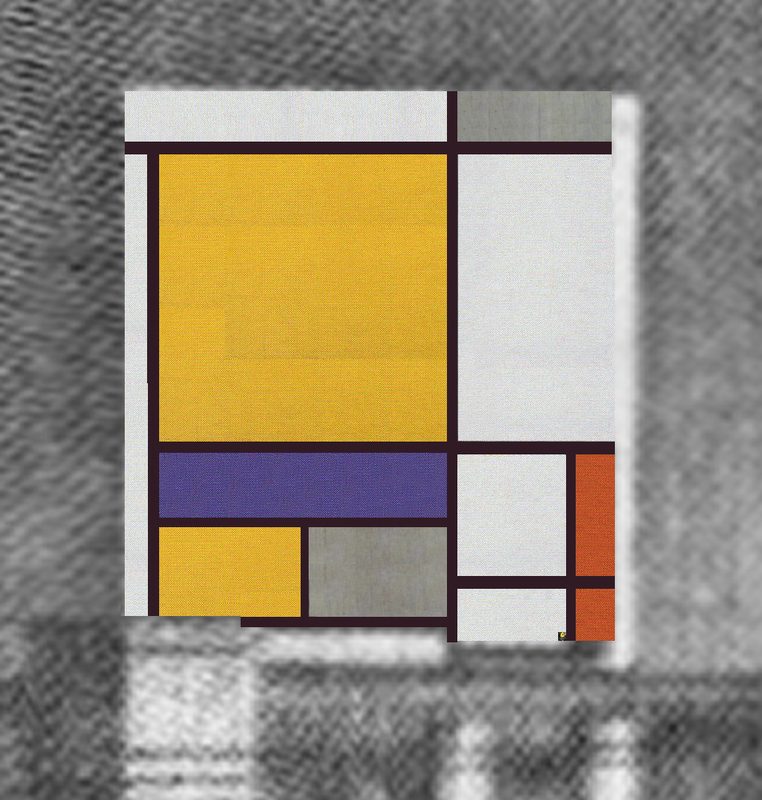 Here's progress from Mondrian in New York which has the original picture of the 'Maîtres du Cubisme' exhibition at L'Effort Moderne, Paris. 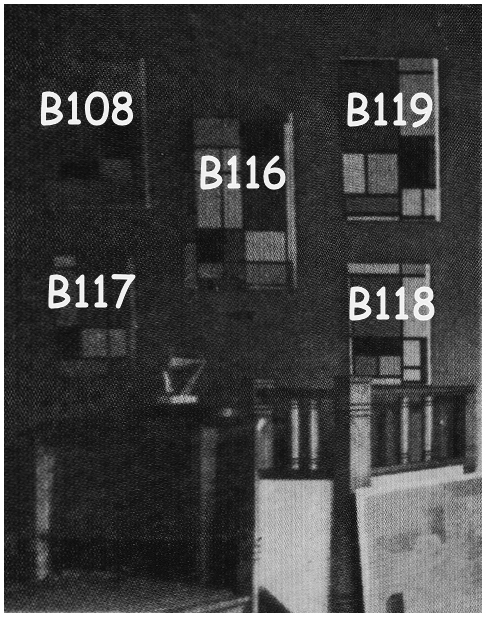 That's clearly the source of the image above because of the handrail obscuring the bottom of B119. Applying perspective correction to the wall of Mondrians results in the first image. 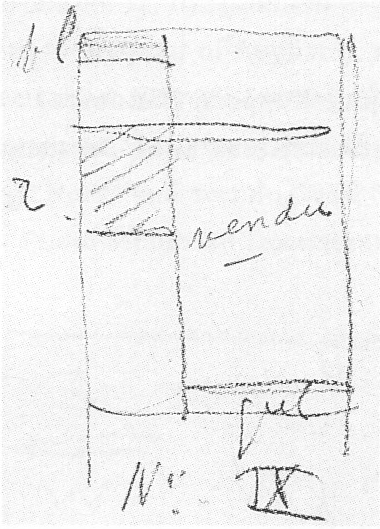 There are five on show, identified in CR as shown in the seond image. B108 is the picture owned until recently by Yves Saint Laurent. 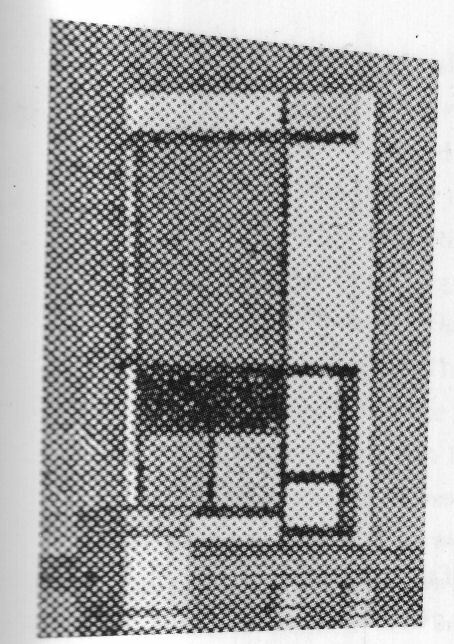 B116 was in the Stephen Mazoh gallery when the CR was written. B117 is at the Dallas Museum of Art. 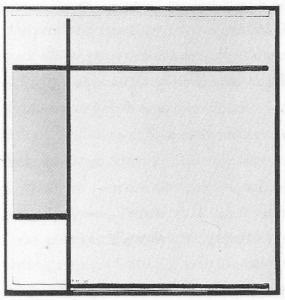 B116 probably offers the most useful reference for guessing the size and colouration of the lost paintings. The titles provide the starting point: B118 Composition with Large Yellow Plane, and B119 Composition with Large Red Plane. 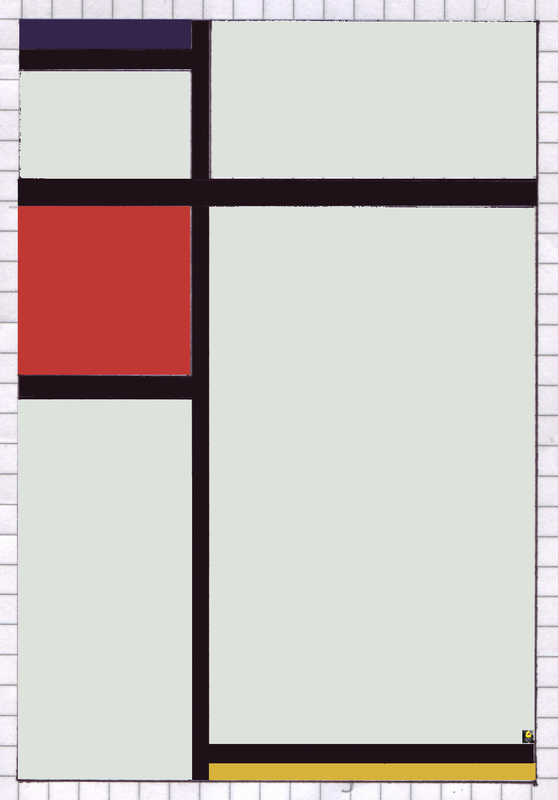 B116 is 88.5 x 72.5 cm. This hadn't occurred to me until I compared the two versions of B116, but as the photograph was not taken with the camera perpendiclar to the wall, the photograph needs a further adjustment to match that ratio in the image of B116. 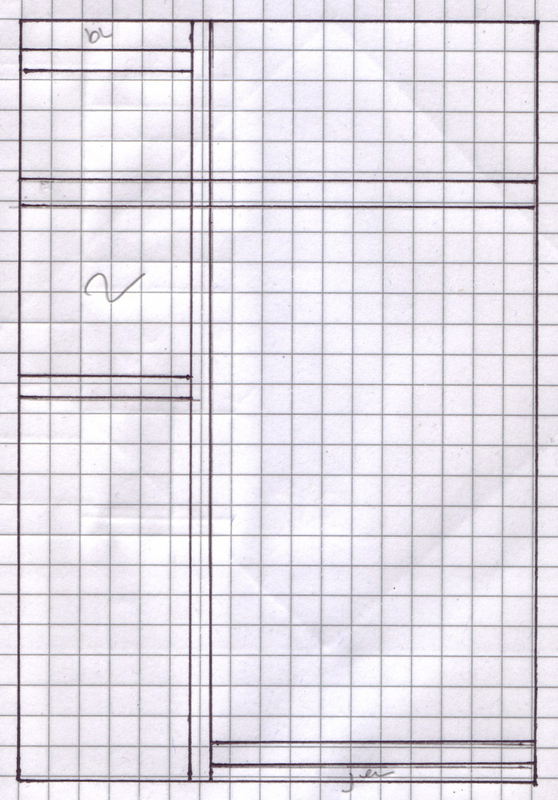 After puzzling some time with the aid of a calculator, I arrived at this version of the wall. 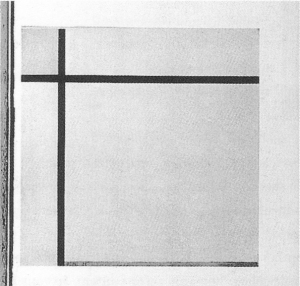 Note that the light strip on the right side of all the pictures is the edge of the canvas. This should be ignored for the size calulations and, of course, for the colours. B118 (yellow) is tricker as it is not possible to tell how much of the picture is hidden behind the handrail. 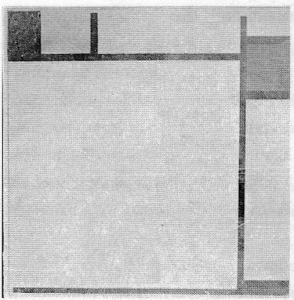 The width comes out as 53cm and assuming (fairly arbitrarily) that the proportions of the canvas were similar to B116 (1.22) and B119 (1.17), the height will be around 63cm. Here's my first attempt at B119. I'm a bit stuck on the colours to apply and so will concentrate my efforts elsewhere and return to these later. 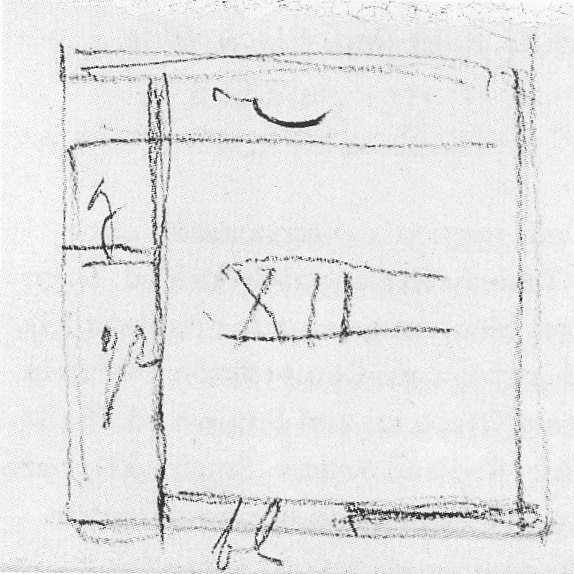 [Nov 2010] After some vacillation on the colours, this is my first draft of B119. I then checked the Catalogue and realised that, as described above, there is some confusion over which is B118 (Large Yellow) and B119 (Large Red). No matter, I'll stick with this rendering for now. 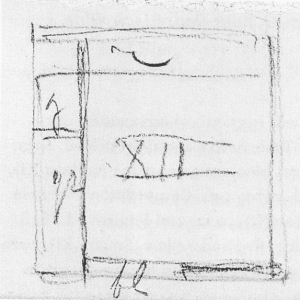 [Feb 2011] And here's a first draft for B118. I'm looking out for a compatible handrail to photograph and paste in. I am rather happier with B118 than B119. 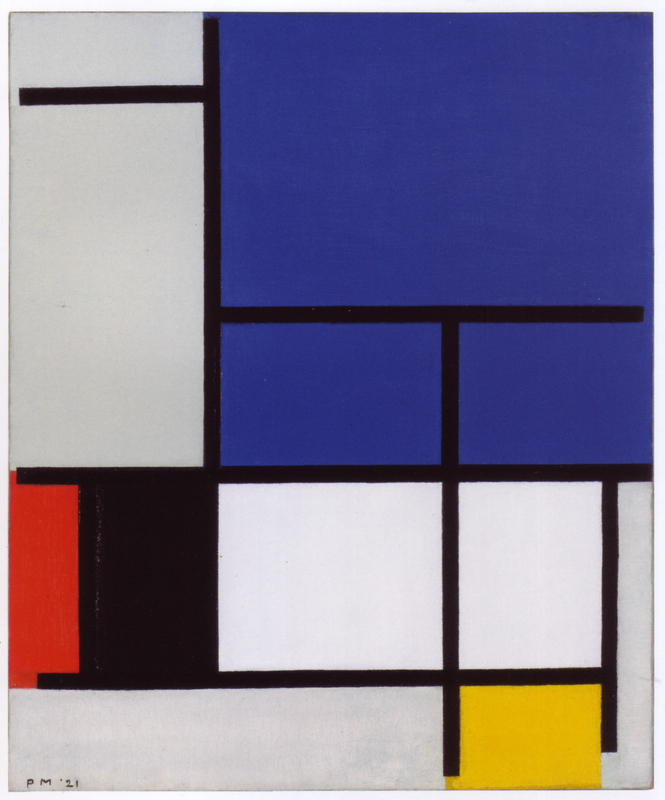 B149 "Komposition mit Gelb, Zinnober, Schwarz, Blau und verschiedenen grauen und weissen Tönen"
Google translate suggests Composition with yellow, vermilion, black, blue and different shades of gray and white. Whereabouts unknown. This picture was in the Hannover Provinzialmuseum, but was confiscated by the Nazi authorities in 1937, presumably in their cull of 'decadent' art. 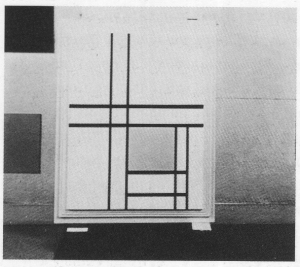 It looks like an interesting piece with the splash of colour within the black (?) 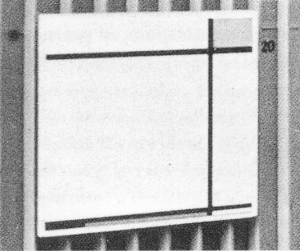 rectangle an unusual feature in the works of this time, pointing to the very late pieces, notably Broadway Boogie Woogie. 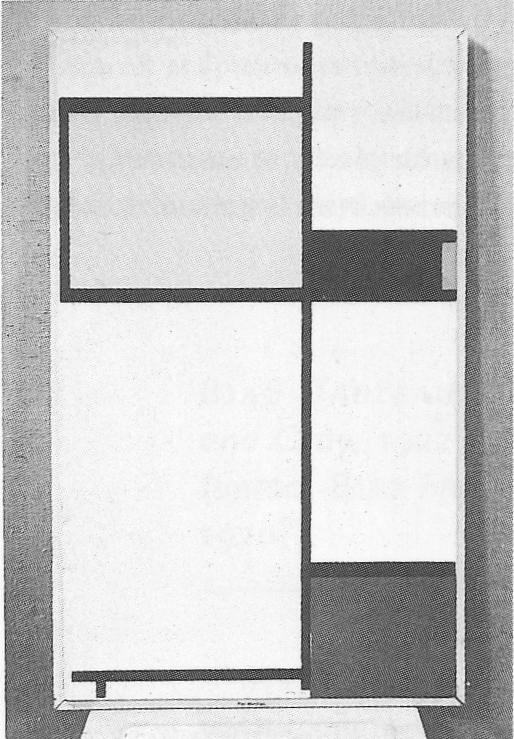 The picture was shown in colour in De Stijl (vol.2 p.395 of the 1968 reprint). 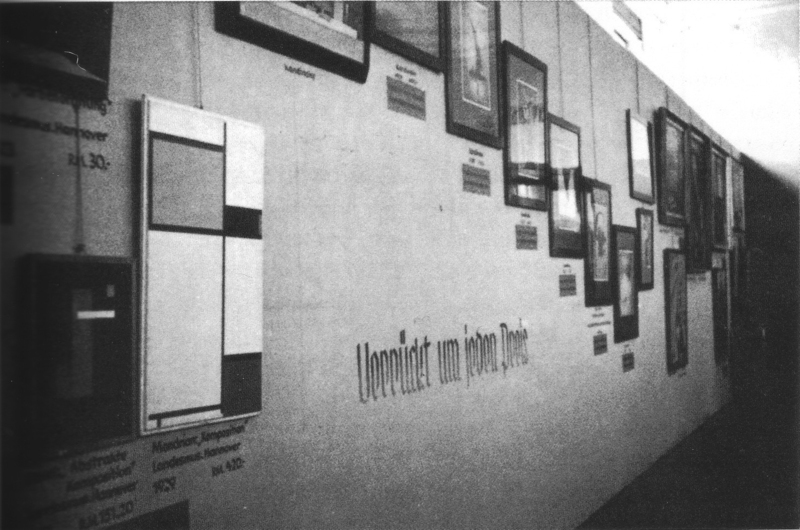 Photographs from Blotkamp, the 1926 exhibition at the Landesmuseum, Hanover together with B174, below, the second from Entartete Kunst, Munich, 1937. 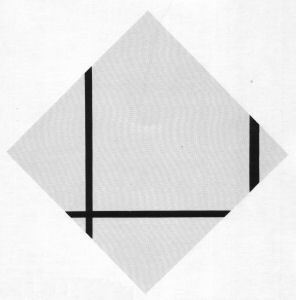 There are some other images of the piece in the Bildarchiv Preussischer Kulturbesitz, but those should not be necessary if I can find it in De Stijl. 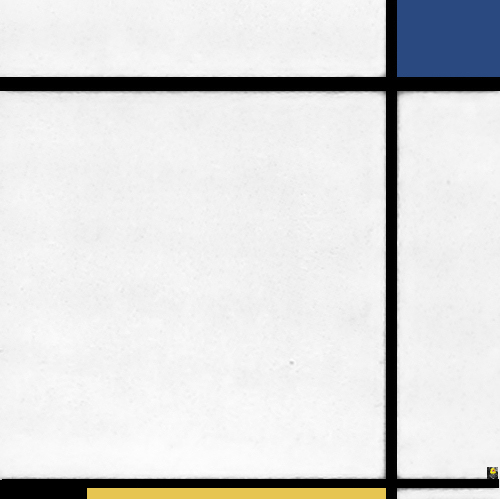 The De Stijl image, showing Mondrian with the painting, is not colour. Here's a first attempt. It is difficult to guess what is happening on the right of the picture. 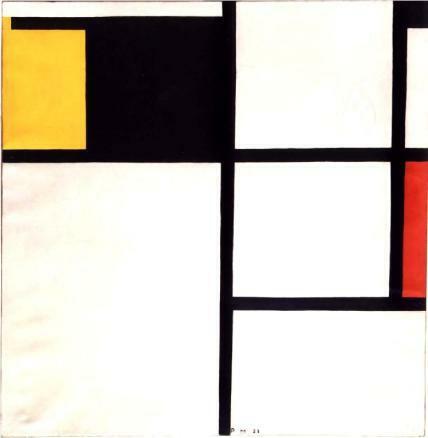 The title requires Yellow, Cinnabar (red), Black, Blue and Various Grey and White Tones. I have reduced the size of the images shown as the number is growing. 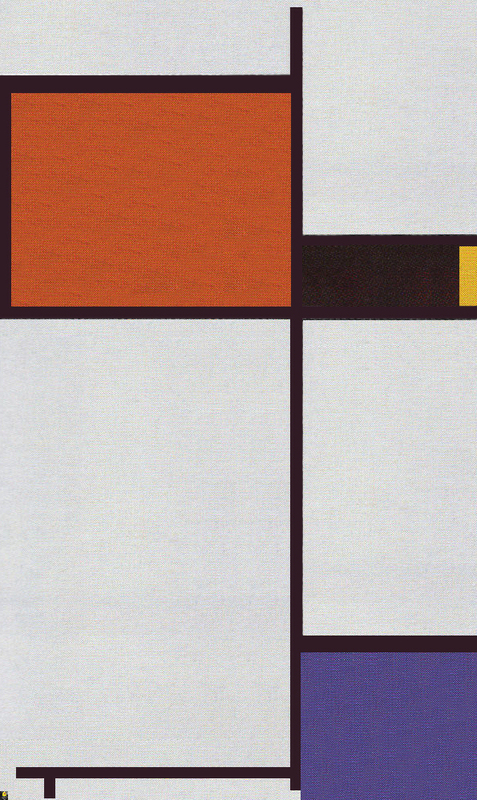 After my first attempt, I found another version of the De Stijl photograph. This includes both Nelly van Doesburg and what I believe to be B146. 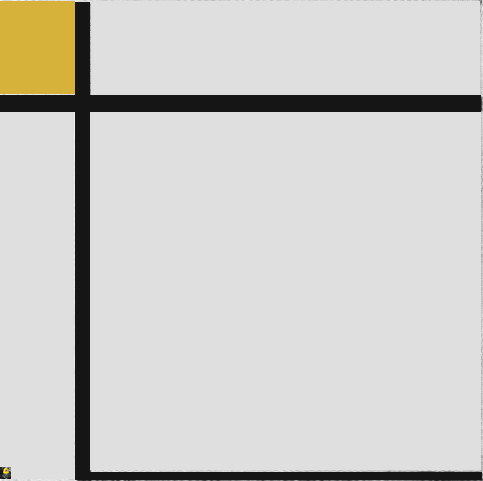 In coming up with my second version, I have also borne in mind B150: there are numerous examples of Mondrian using design motifs over several contemporanious pieces and so the yellow and black section might possibly have been repeated. I'll go with this version for now. Whereabouts unknown, no suggestions of an available colour image. One of the works consigned to Sophie Kuppers in Hanover / Dresden, it was sold (?) in 1925 to Ida Bienert, who commissioned B167. The German Wikipedia page on Ida Bienert states that her collection was preserved during the war and mentions a couple of sources that might be worth looking at. 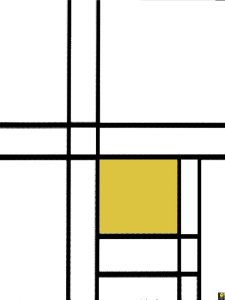 Carmean's interpretation of PM's symbols on sketches makes the colour layout clear and so this is a good candidate for the first colour reconstruction. 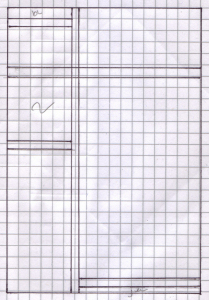 The third image is my drawing of the layout: the black lines are unusually wide. 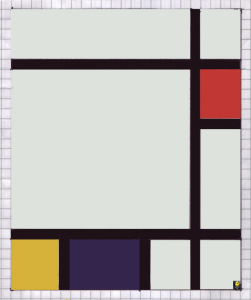 The fourth is the final version with colour. 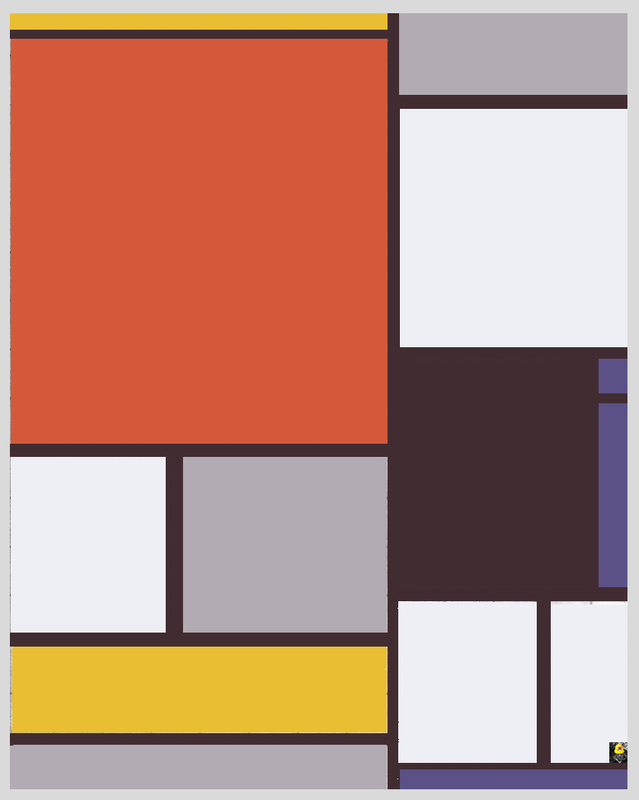 I have used the colours of B156. 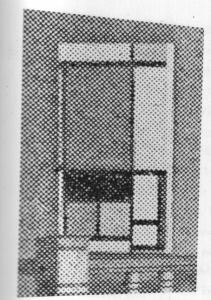 Sent to Kunstausstellung Kühl, Dresden, 1926 with B169, B170 and B172. 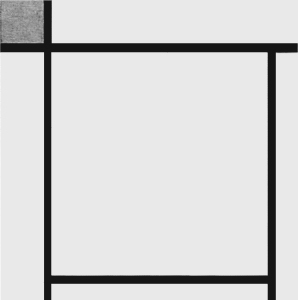 No colour image known. Full installation photograph which includes B154 found November 2010. 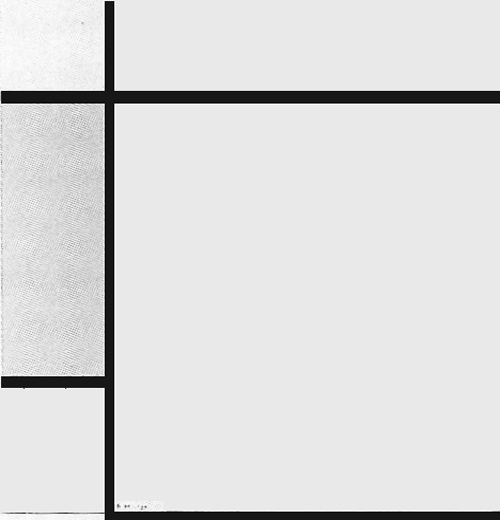 Here are B154, the two pictures with perspective corrected and B171'squared' to 50x50 with the lines blackened. 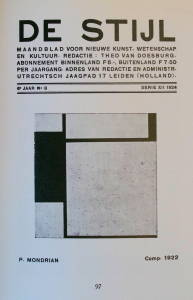 I'll look for a better version of B154 (found in Meuris) to use for the final colours. 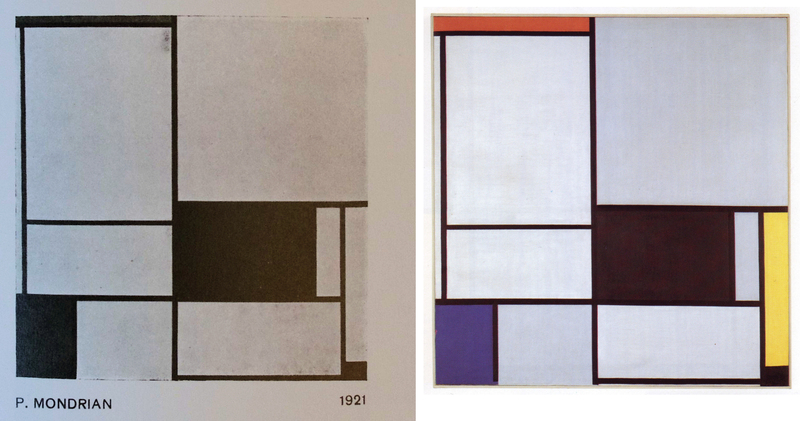 The next stage is to analyse the shades of grey on the two works and interpret (or guess) the colours on B171. 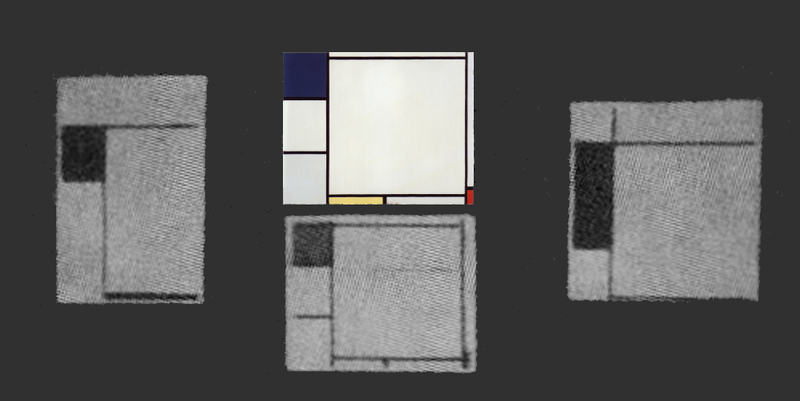 A higher-resolution image of the B&W image would be useful, but based on the readings so far, the top right area seems to be blue rather than the yellow I had supposed. The bottom line looks like black, yellow, white with all the other areas white. 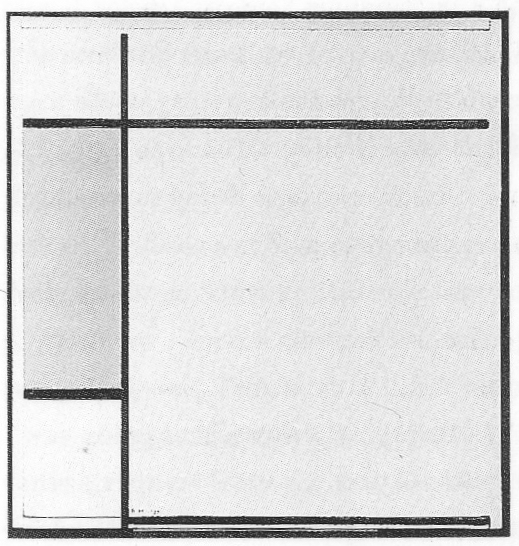 That gives the fourth image (waiting for a better 'white'), but there is too much uncertainty to be satisfied with this as a conclusion. 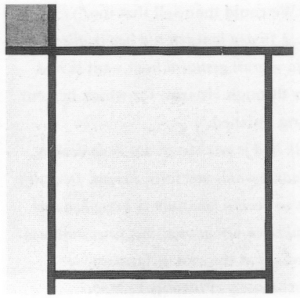 I believe from the picture's URL that it appeared in Volume 30 Issue 1, March 2007 of the Oxford Art Journal, though it is not clear from the Table of Contents which article it might have been associated with. 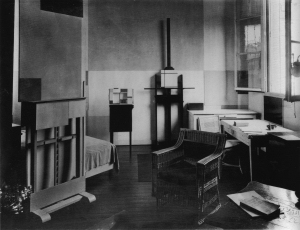 Sent to Kunstausstellung Kühl, Dresden, 1927. 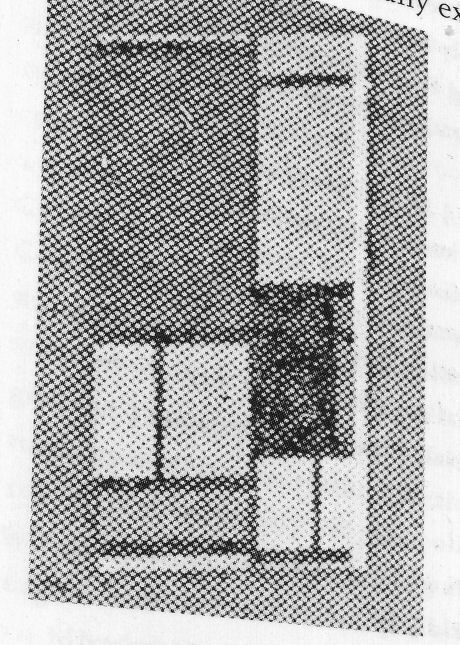 Image from a 1929 exh., Frankfurt. For the photograph, it lists B184, B185, B186, B160, B162 and B159. The photograph is credited to Grete Leistikow. Thanks Grete. 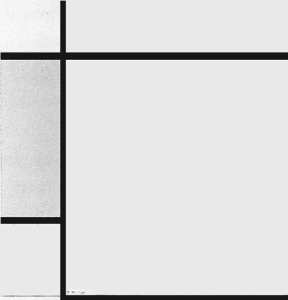 I have reconstructed the photograph's layout from the images on this site. B186 is another lost PM and so it makes sense to consider both. B184 and B186 are 'size unknown'. 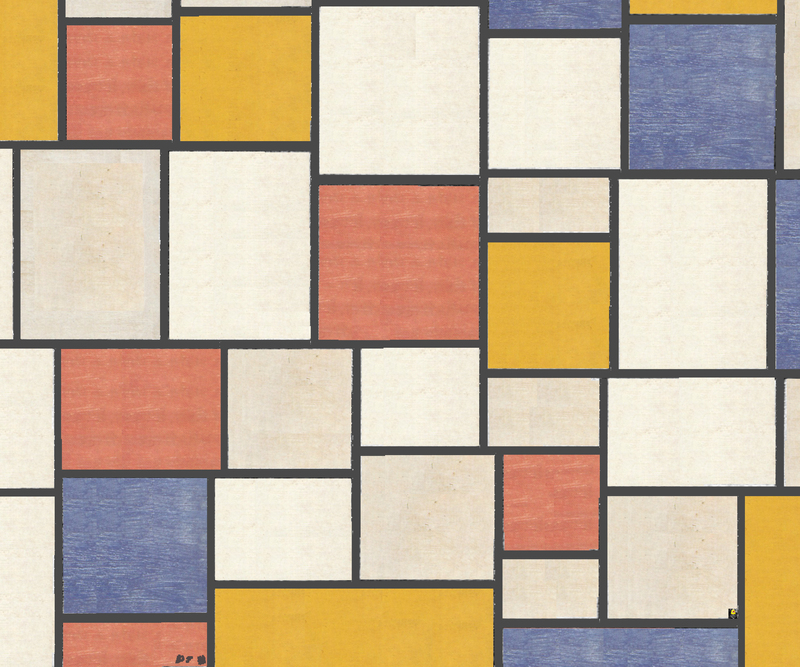 B185 is approx 40x50cm, so that makes B184 around 38x56cm and B186 50x52cm. 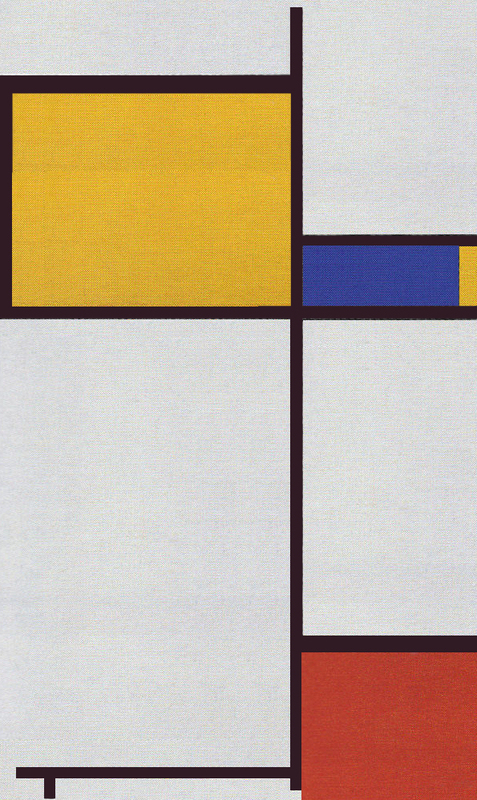 Colours are (as usual) tricky to judge. The large coloured area in B185 (top left) is blue, suggesting that the large colour areas in B184 and B186 are not blue and thus probably red or black. 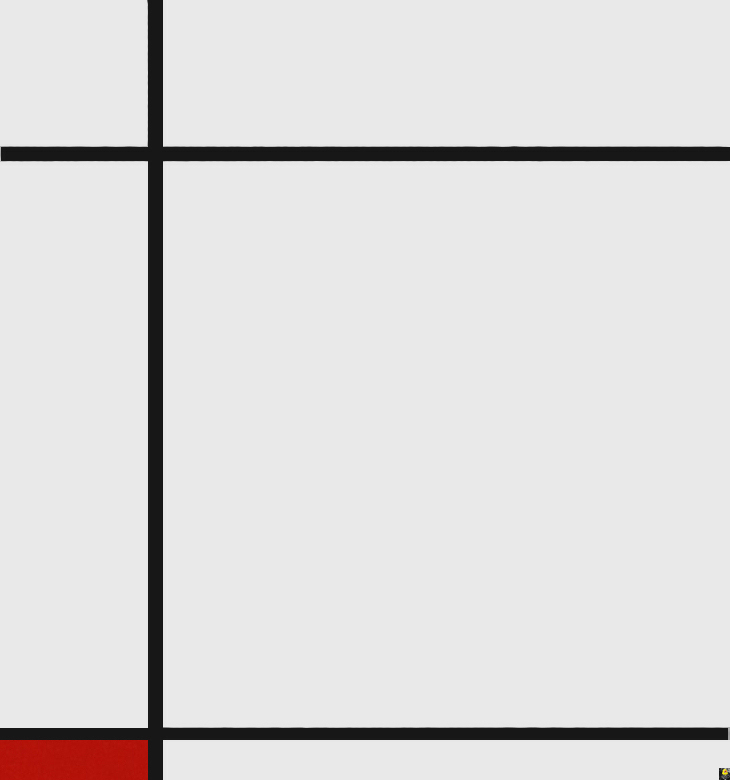 The only red area in B185 (bottom right) is too small in the picture I have to draw a conclusion. 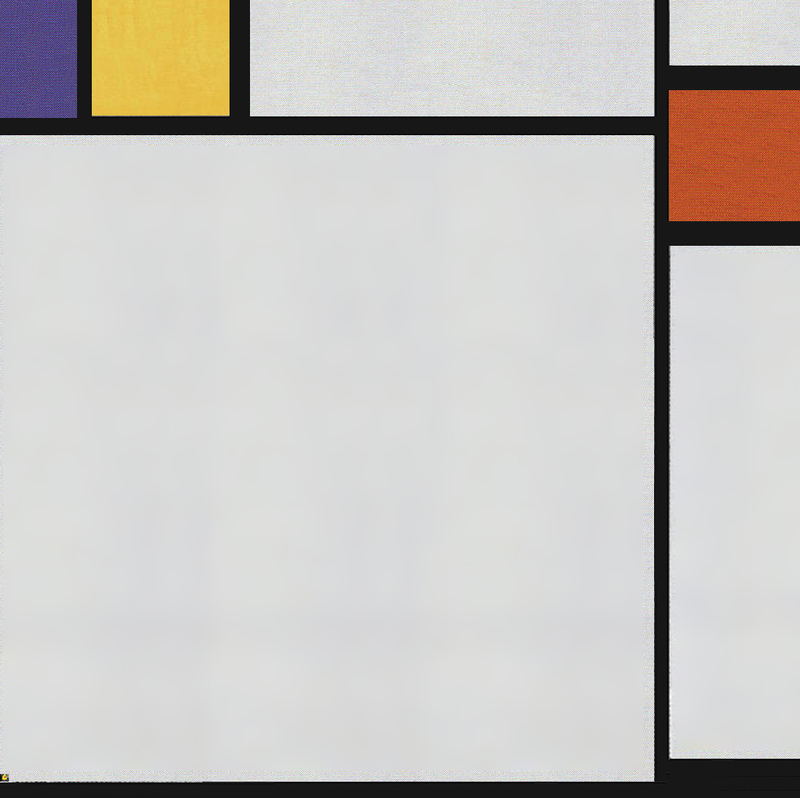 In both cases, it is not clear what is happening at the bottom of the piece: most of the pictures of the time have a black line and thin lines or blocks of colour beneath. I have made a start on the structures, but will leave the colours for now. 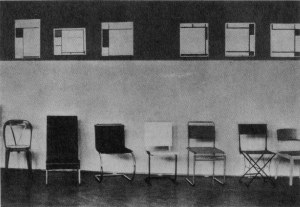 [Feb 2011] As noted in the summary above, the photograph with the chairs is an installation photograph from Der Stuhl, Frankfurt, 1929 and appeared in Das Neue Frankfurt, March 1929. 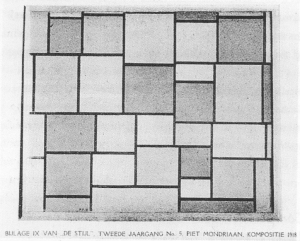 The source of the B186 image is a photograph in the Van Doesburg-Van Moorsel Archive. The V&A has a copy of Das Neue Frankfurt. 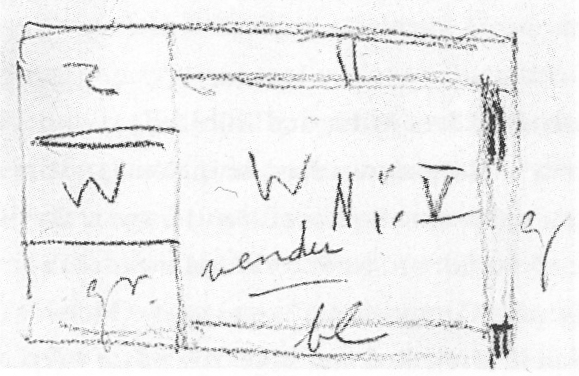 I have written to the Archive in an effort to obtain a copy of the full photograph. [Jun 2011] No sign of a reply and so with publication in mind, and in hope of eventually getting a decent photograph and finishing the job, here are the drafts. 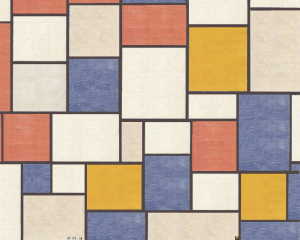 I'm guessing there's at least some yellow in B186. Whereabouts unknown. 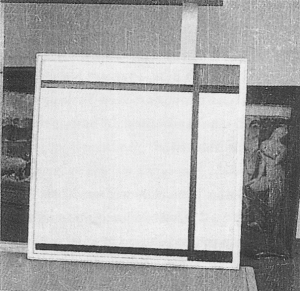 Confiscated by the Nazi authorities in 1937 from the Museum Folkwang, Essen and registered as #16173. Google translate renders Farbige Aufteilung as, coloured division. 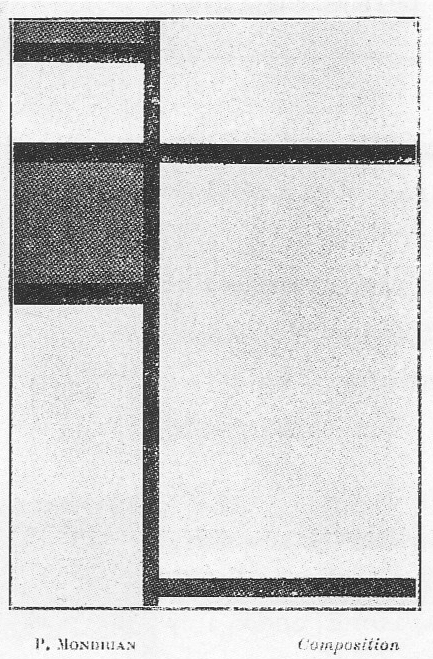 No suggestions of an available colour image, but check the 1991 reconstruction. 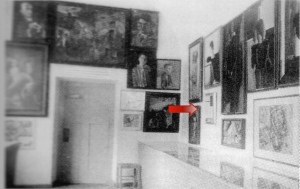 There's a very small reproduction of the full photograph of Room G from from Entartete Kunst in CR, now added, it seems unlikely that this is the source of the B&W image of B202, so the search continues. The black and white is done with the colour to follow. The colour block at the bottom, seemingly without a black surround looks leading edge. 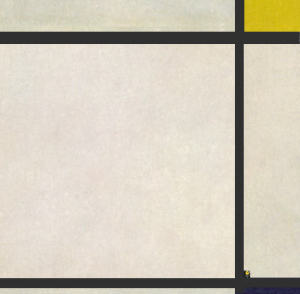 [June 2011] Looking at the bottom left again, the corner might be a different shade of grey from the others, suggesting yellow: I'll go with that for a first attempt. 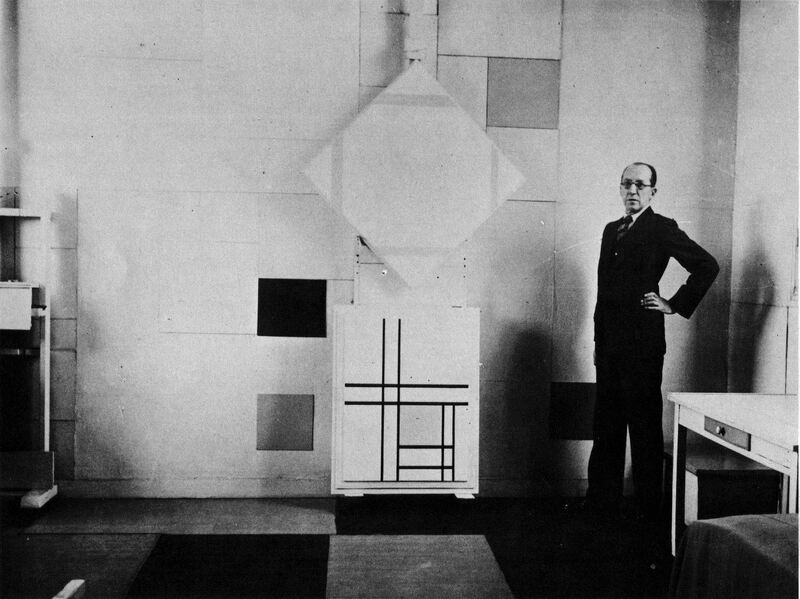 The photograph is of Mondrian in 1933 with B241 and B242 in his studio at rue du Départ, Paris. B242 should be straightforward to reconstruct. 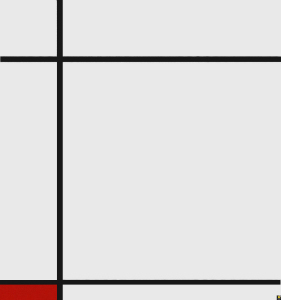 The diagonal of B241 is 113cm: on that basis, B242 measures approx 75x100cm. 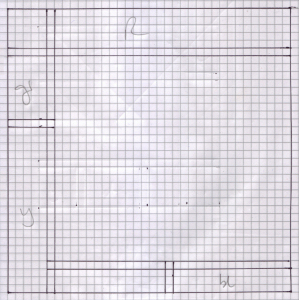 I have drawn up a composition based on those measures, but perhaps it just needs straightening up with a yellow insert. 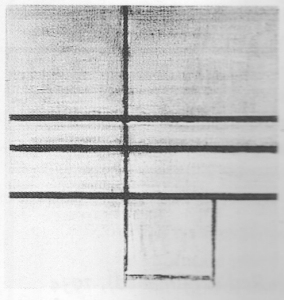 There is no available image of this painting, only the sketch. It is one of several works (along with 149, 157, 161, 164, 174...) consigned to Sophie Küppers in Hanover and Dresden in the 1920s. Some were confiscated by the Nazis (149...), others presumably just lost during the war. Having deciphered the colour coding with the help of Carmean, B158 and B164 are worth a try. 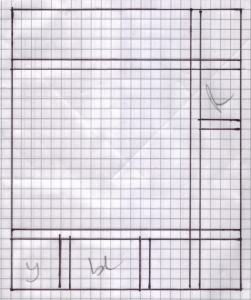 B158 has measurements, B164, not so I will apply the dimensions of one to the other. 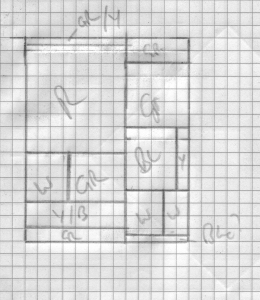 B158 is my second reconstruction attempt. The first, B161, was a good starting point and informs B158. 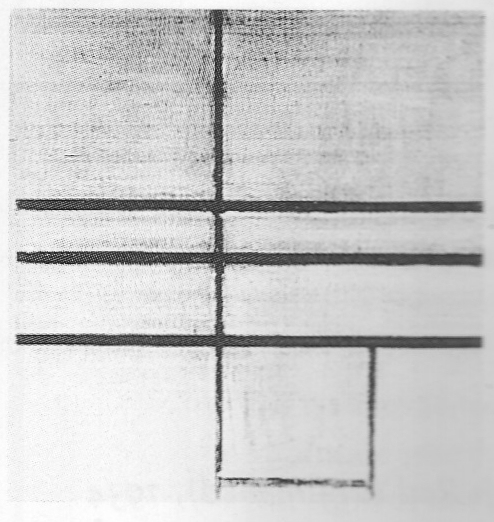 Of particular note is the thickness of the black lines which is consistent in B161, although you would not guess that from the sketch. It is a fair assumption that the same can be applied to B158. The bottom row does not look particularly elegant at first sight, but it seems pretty clear that it's yellow, blue, white, white and thick lines are assumed. I'll take a view when completed. I'm not much impressed by the colour version either. 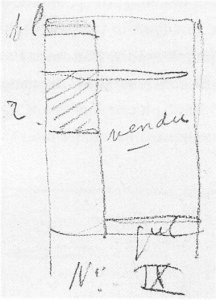 The third reconstruction. 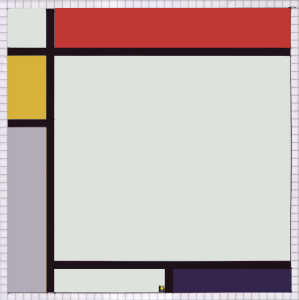 Sizing B164 by reference to B158 (which is 44x54cm) gives an estimate of 66cm square. 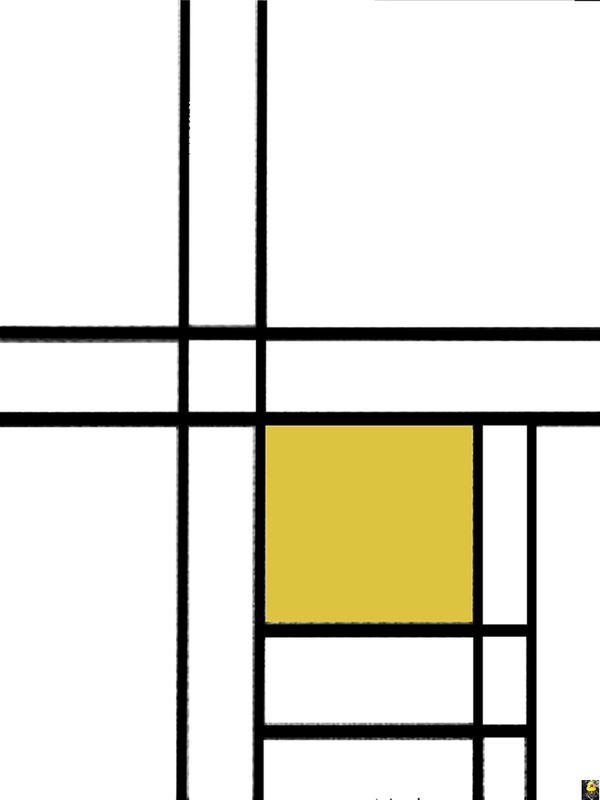 The grey and yellow are the wrong way around in my sketch. 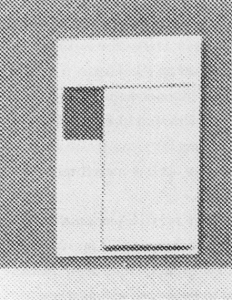 No suggestions for a colour image, the B&W image is from a photograph in the V. Huszár estate. 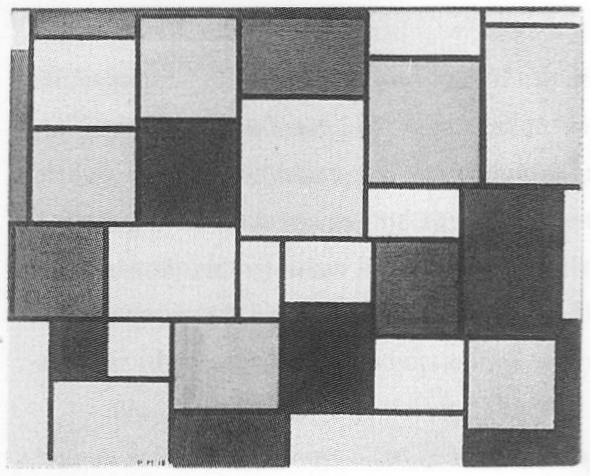 No suggestions for a colour image. [28th Nov 2010] The starting point must be a decent copy of B92, which Blotkamp has provided. 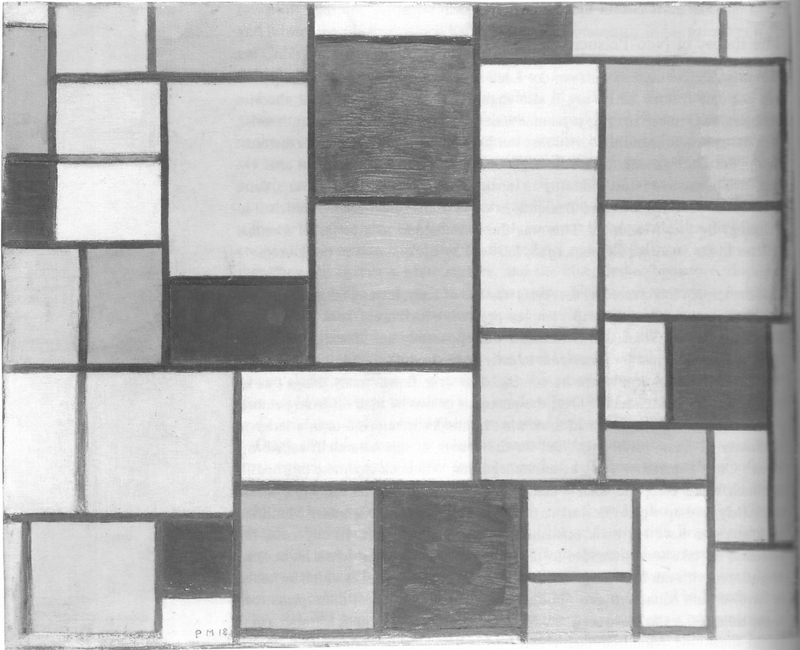 Thereafter, it is just a question of being bold and not losing sight of the fact that the colours are (relatively) unimportant. 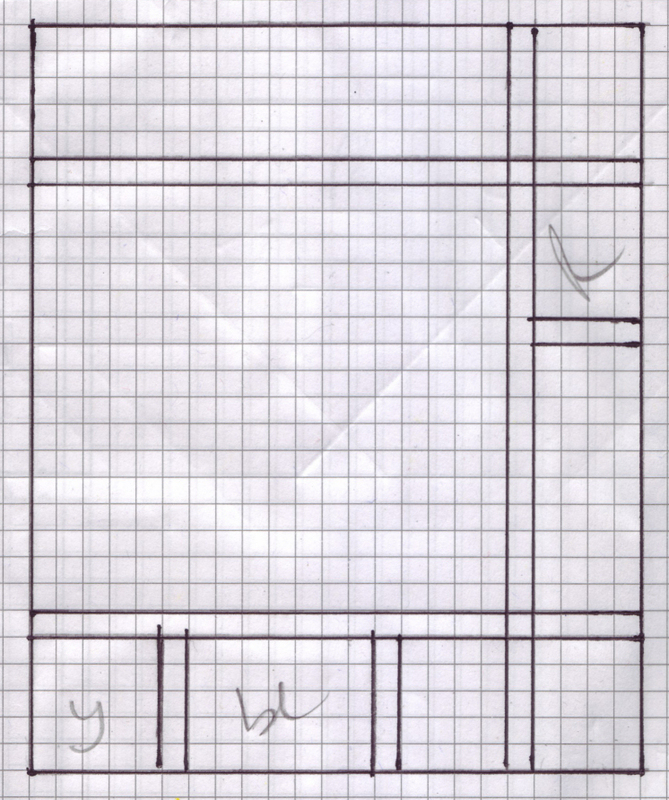 Here's my first draft of B93. It is noticable that in tessellating B92, PM avoided adjacent repetitions of the same colour almost entirely: there is an overlap of blue planes at top middle and the whites and greys have different rules, but that's about it. 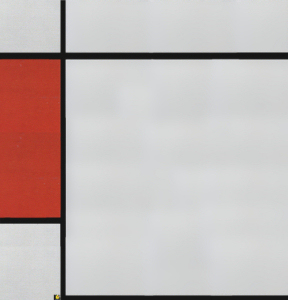 Judging from the B&W image of B93, it looks as though this does have adjacent reds, something strange happening at the top in red and at the middle right in blue. 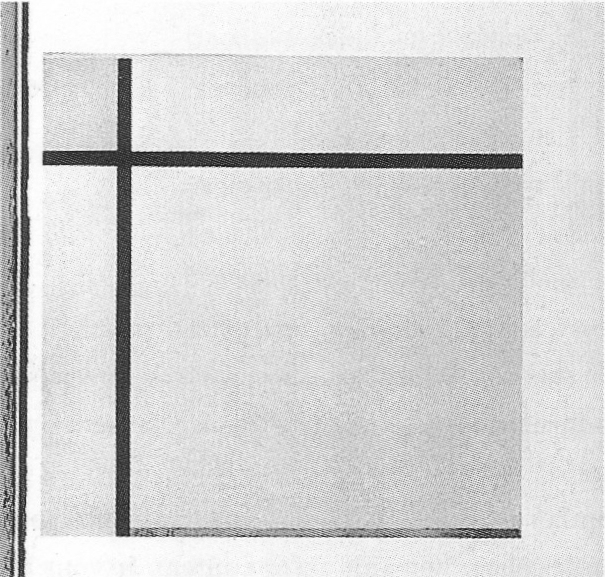 This could be because I have misinterpreted where the painting ends and the frame or shadows on the photograph begin. 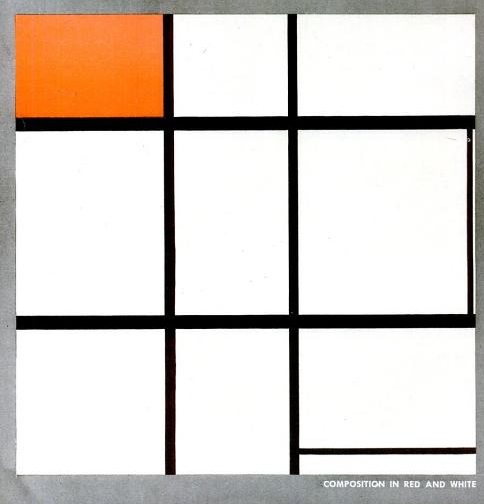 B94 might prove trickier because the photograph is much paler, as noted above, Mondrian commented that in the De Stijl reproduction, 'The yellow is quite pale'... I've had a try - I think there's too much white and grey in it, but it provides a starting point. 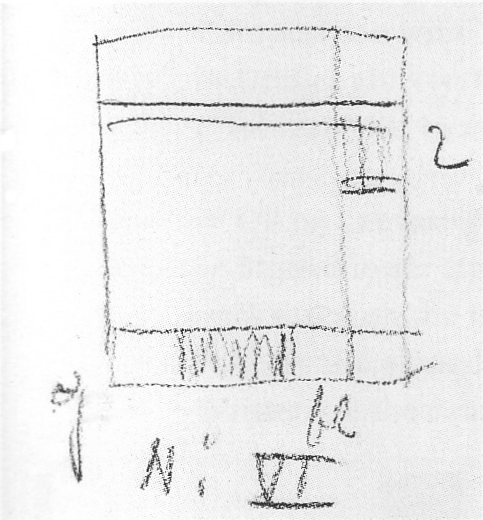 There is no mention of yellow in the title, though the sketch suggests that the narrow panel on the right might be yellow. I'll try with and without. Whereabouts unknown. loaned by Sophie Küppers to the Hannover Provinzialmuseum, confiscated by the Nazi authorities in 1937 and stored in Niederschönhausen as #7034. Google translate renders this as, Yellow with blue, black and various shades of light gray and white . 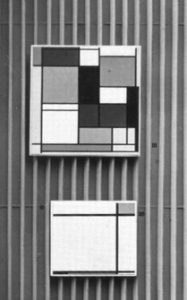 Installation photograph from Hannover 1929 shows B174 and B149. 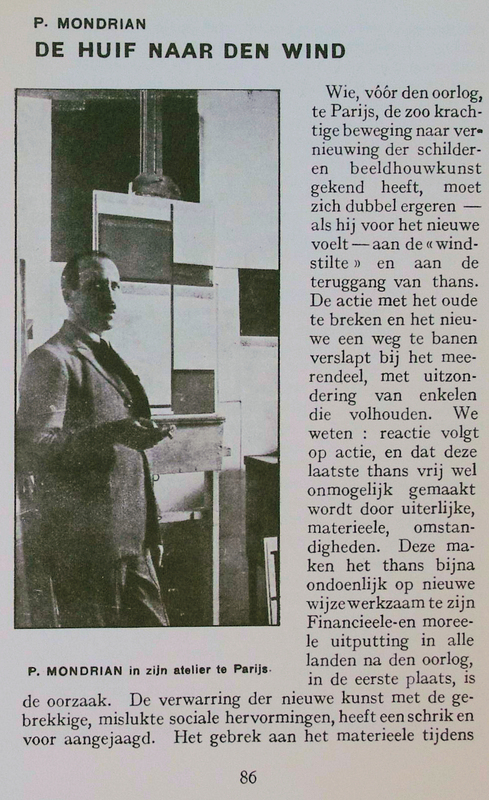 The second shows B173 and B174 at a 1926 exhibition in Amsterdam: B173 just has a small splash of blue. 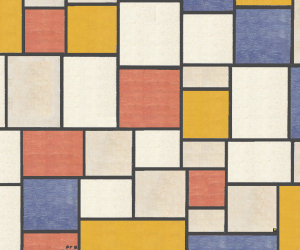 In December 2010 I added signature details for all the abstracts from 1920 onwards. In a few cases, this one in particular, that gives a clue for reconstruction: CR suggests that the lower right is blue, so let's go with that. B175 is shown next to B178, a stage set model which is 35x40cm. 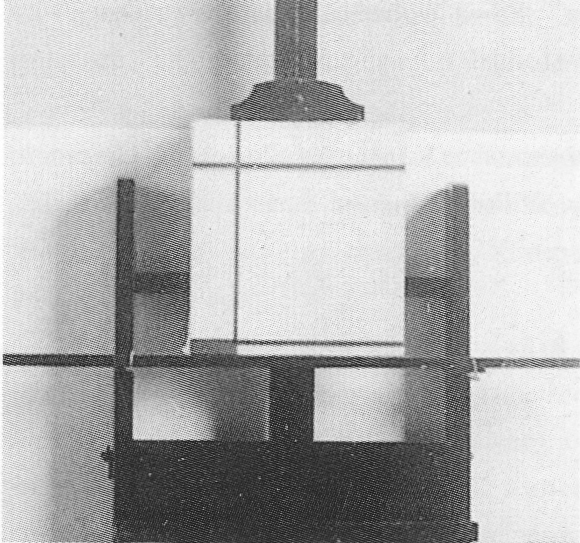 If the height of the model is 35cm, then B175 is around 36.5x39cm. 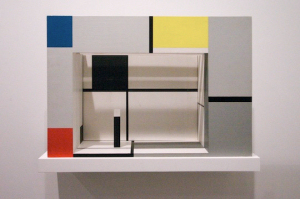 If the colours on the stage set reconstruction are to be believed, the colour in B175 is closest to the bottom left of the model and thus red. 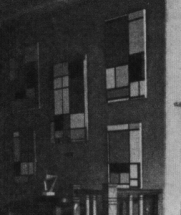 Whereabouts unknown, no suggestions of an available colour image. 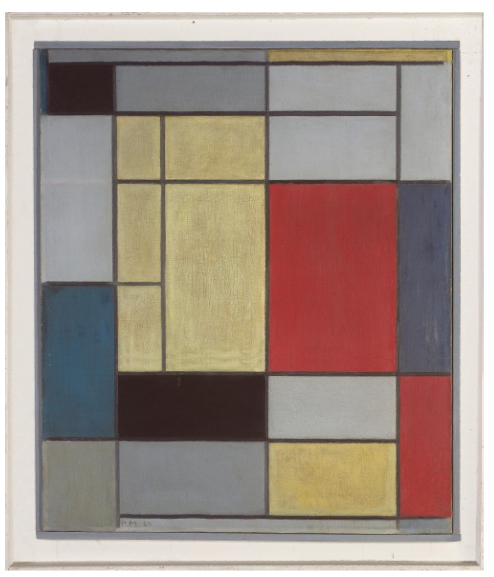 Sent to Katherine S. Dreier, New York in 1926, exhibited in Brooklyn, New York, Buffalo and Toronto in 1926-27, sold by Dreier in 1927. 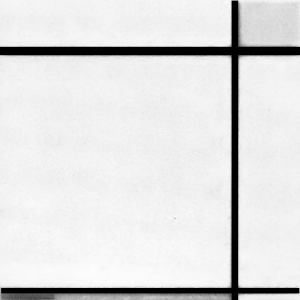 The shade of the grey image suggests yellow. 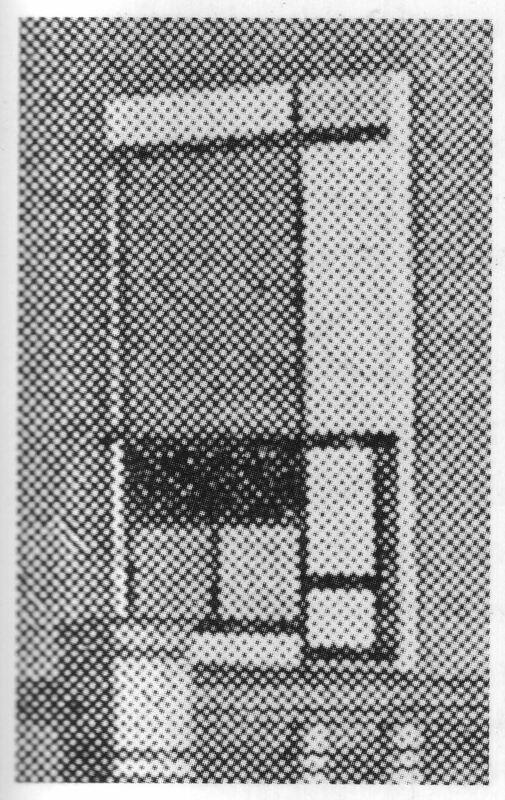 Only known from a photograph in Harry Holtzman's collection. The colours are going to be difficult to call on this one. 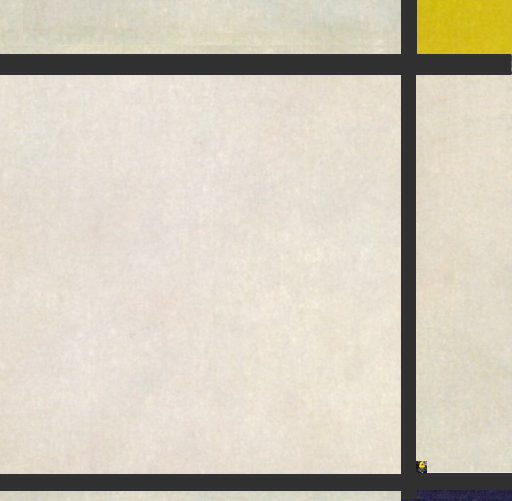 In addition, are the vertical lines stopping short of the top of the picture? 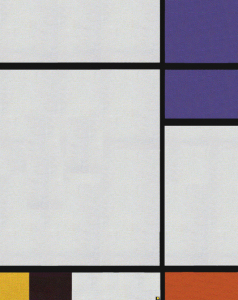 And what colour is the horizontal line at the bottom: is it black (in which case, what colour is the short line immediately above it on the right? ); or is it a groundbreaking non-black? Neither option seems plausible. For this and B181 I emailed the Mondrian Trust (Feb 2011) to ask whether they had the original photographs. They referred me to the Holtzman Deposit at Yale, where I am trying to find a contact. [Jun 2011] No reply, taking a guess for publication. I like red for this one, though blue is equally likely. 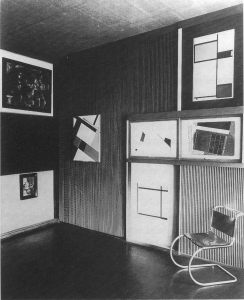 Sent to Kunstausstellung Kühl, Dresden, 1927. 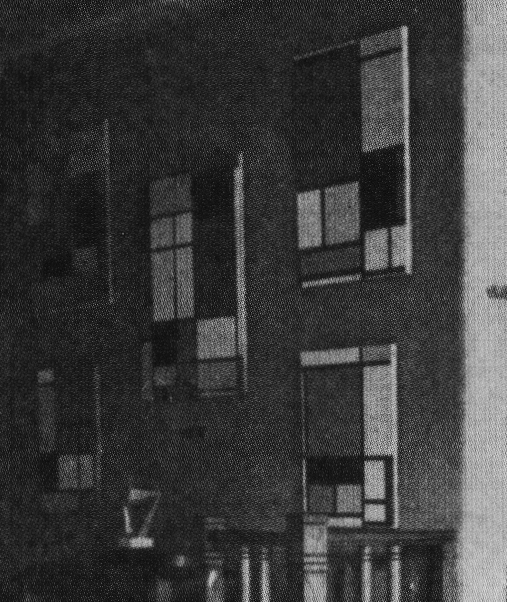 Exhibited in 1929, Frankfurt. 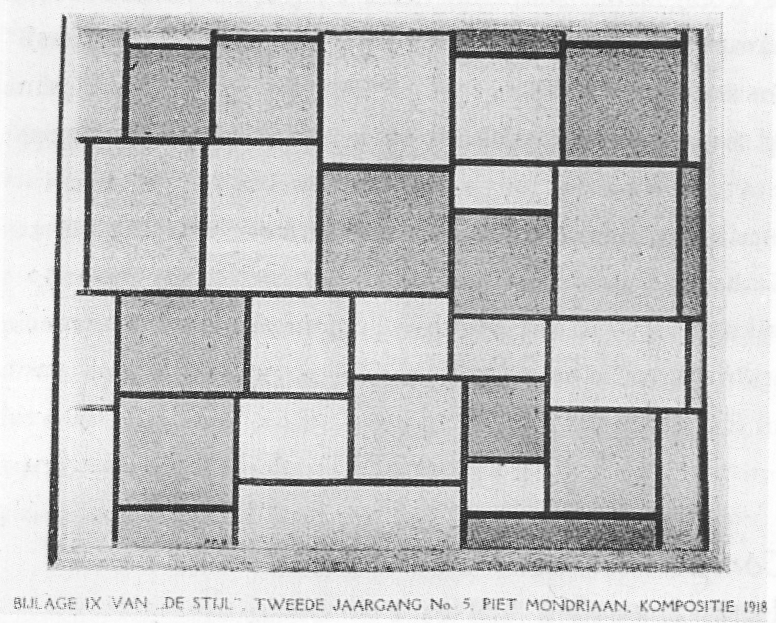 Image from the Van Doesburg-Van Moorsel Archives. 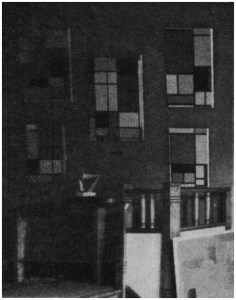 Whereabouts unknown, this picture is only known from a reproduction in De Stijl No.8. 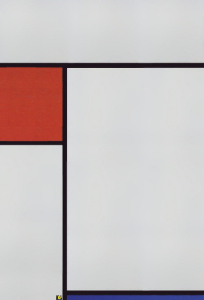 Temporary image, as CR states that the De Stijl reproduction was in colour in the edition reprinted in 1968 (vol.2 p.405). There's a copy in the V&A. 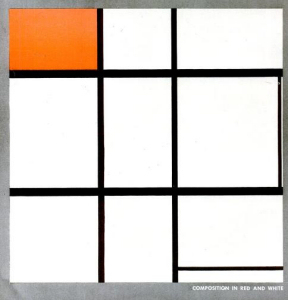 The De Stijl image is black and white and so reconstruction is necessary. 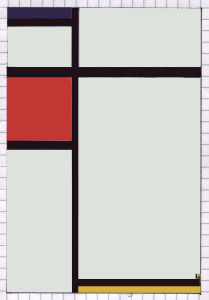 I will use B129 from De Stijl as a reference. 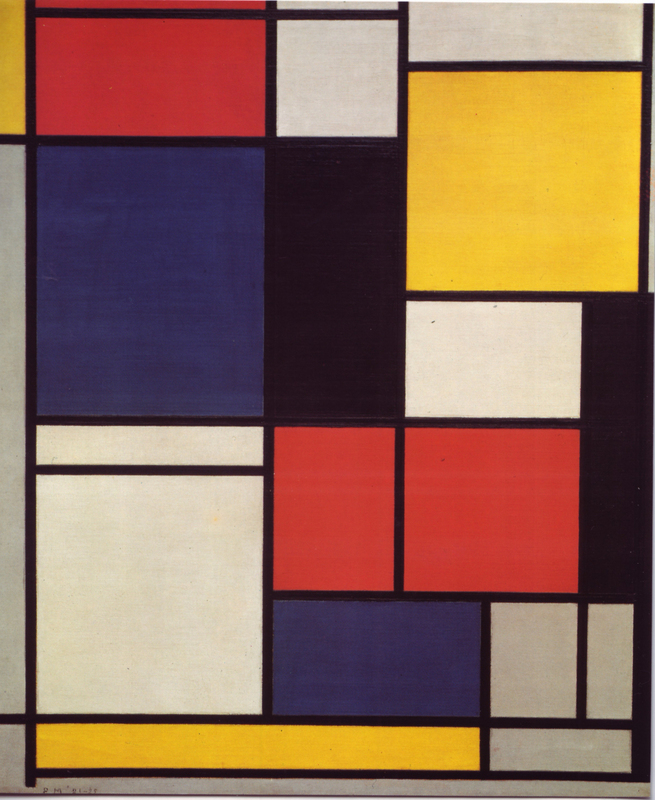 Bought by Paul Bittencourt, São Paulo, in 1958 and subsequently destroyed in a fire. The image is from Life Magazine Speaking of Pictures, 2nd July 1945. More details here. 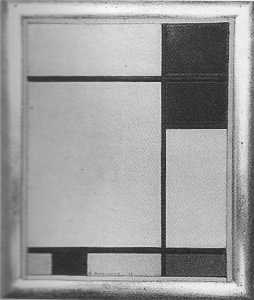 Whereabouts unknown, the work is only known from a 1934 photograph by Eugene Lux. As this is at such an early stage of development, there is little point in trying to reconstruct it. Dec 2012 5th draft 5 £28.43 1 in stock, copies left at Mondrian exhibitions at Tate Liverpool and Turner Contemporary. 2 unaccounted for (I guess I left them at other galleries). Dec 2014 1st edition 10 £51.69 7 in stock. 1 to the British Library, 1 to Nancy Troy, 1 unaccounted for. 5 being kept in reserve for the other British Deposits. Mar 2015 1st edn, 2nd print 10 £35 + £11 awaiting delivery. 1 will be sent to Mark Caywood.